Cocktail Hacker » Blog Archive » Vesper – Mmmm…Tasty? Bond is doubtless a man who likes a strong cocktail. In the case of the Vesper I really have to call his judgement in to question though. The first note I have about this cocktail in my notebook is that the gin completely overwhelms the Lillet. Interestingly in my later internet browsings I found that David Wondrich has similar feelings. In my later mixes of this drink I upped the Lillet to 1/2 oz (1 part in my case) which helped a great deal. 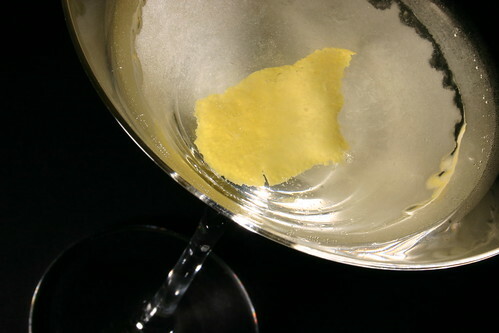 As for preparation I found that, like Doug of the Pegu Blog, I prefer this drink shaken. Now, before you take away my cocktail snob membership card, remember that the most important point in cocktail making is creating the drink that you prefer. Yes, the resulting cocktail is a little cloudy, no I don’t think the gin gets bruised, and yes it is delightfully cold when you’re done. For me that’s the perfect combination. There were two more small hurdles to get over with this drink, both of which stem from the same problem. Whether we like it or not, in some cases ingredients change over time. In the case of the Vesper both the gin and the Lillet have changed since the cocktail was first introduced. Let’s talk gin first. Gordon’s gin, which Bond calls out by name, used to be 100 proof. It’s now 80. This was a fairly simple problem to fix. I took Gary Regan’s advice and subbed in Tanqueray which comes in at a heart 94.6 proof. The Lillet was a bit tougher to match. You may remember that I had similar issues when I was sampling the Corpse Reviver #2. This time I decided I’d try a technique I saw mentioned on the web (sorry can’t seem to remember where). 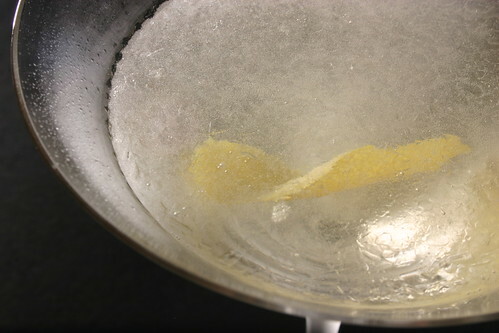 I mixed up the standard Vesper (1 1/2 : 1/2 : 1/4) and added 1/8 tsp of cinchona powder to the mix. The thought being that the cinchona powder would add some bitterness as it is a natural source of quinine. The result was a lightly red cocktail with tiny bark flecks floating in it. The additional bitterness didn’t really come through as I had hoped though. I think this is due largely in part to the fact that the cinchona didn’t have sufficient time to steep in the drink before I started consuming. Were I to go this route again I’d allow the gin, vodka and Lillet about 3 minutes soak with the cinchona powder before shaking. So, after that experiment fizzled I opted for the same solution that I used with the Corpse Reviver #2 and added some bitters. I started with 2 dashes of lemon bitters, but I found that the bitters flavor overpowered the rest and it almost became over-lemony when I added the twist. So, I mixed up another with orange bitters (1 dash). That did it for me. You got a little touch of bitterness and the orange flavor worked well with the citrus notes of the Lillet. What’s the end result of all this experimenting and subsequent rambling? I’ve created a Vesper that, although not exactly as Mr. Bond would order it, is a cocktail that I would willingly drink.